Those words still echo through my mind, spoken by a professor friend of mine. I walked (maybe even skipped) across the big stage to receive my degree from Dallas Seminary in May but in that moment, I couldn’t help but feel like I wasn’t done yet. There was more left to know and learn. I know enough to be dangerous, but I know I need more. Which is why I’m up blogging at 2:49am instead of sleeping. The scene was not uncommon in the Gospels: Jesus teaching. The audience also not uncommon: the twelve disciples, various other followers, and the skeptics: the religious teachers of the law. I always image the religious teachers standing with their arms crossed in the back of the crowd whenever Jesus taught. Yet still hanging on to every word Jesus said, to judge and find fault with him, or perhaps on the verge of believing he was more than just a teacher or prophet. Then, a woman was “placed” before Jesus. This woman, they said was caught in the very act of adultery. “Such women” were to be stoned. The crowd eagerly listened. Perhaps Mothers with young children scurried back to their homes, offended to be in the presence of this woman. I always imagine her wrapped in a sheet. However this woman was presented, I’m sure her face wasn’t unknown to those in the crowd. They knew her, at least her reputation. And now this reputation was confirmed as she knelt on the ground, weeping tears from the depths of her heart and soul. Her sin was now exposed. The Old Testament was serious about sin. Well, God is serious about sin, but read Leviticus for a new view. It will bring perspective to the demands a Holy God. He expected holiness from His people. God’s wrath and jealousy for his people was that they have devotion to only Him, and that their actions reflect this devotion. The religious leaders knew the Old Testament like the back of their hands. Yet this picture in John 8 paints a different picture of God. Next, Jesus writes in the sand. Bible scholars have their own speculations on what he wrote, but truthfully, we really don’t know what it was. And one by one, they all walked away. No one could condemn her. Not even the sin-less Jesus Christ, who knelt down next to her. Friends, there is much to be said about these short 11 verses. But tonight, I will not begin to say it. 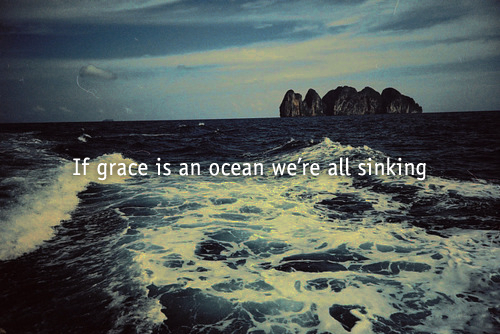 We all are sinners in desperate need of God’s grace. Good thing for us: God is in no short supply of grace. He has lavished it upon us in ways we may never know. So walk in grace today. Wherever you are, whatever your situation, whatever your story is: may it be told with grace. Lining every corner and crevice of your heart.